Today's card screams cheerfulness!!! I received this card from Ann as part of a team swap. 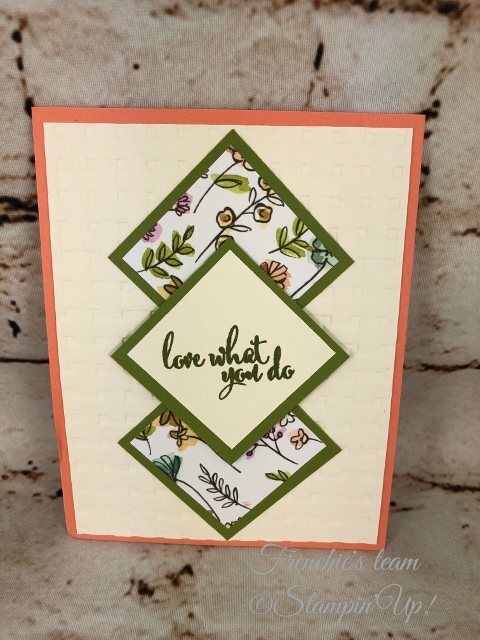 She started with the new In-Color Grapefruit Grove for her card base and added So Saffron as her first layer after she had given it a lovely texure with the Basket Weave Embossing Folder. Using the Layering Squares Framelits she cut out two pieces of the Share What You Love Specialty Designer Series Paper and one square of equal size of the So Saffron Cardstock. Stamped her image on the cardstock with Old Olive Ink and cut three larger squares of the Old Olive Carstock for her backers. She then adhered her layers together and popped up the center square with dimensionals. Such an elegant card but simple too. Card Base - Grapefruit Grove - 8 1/2" x 5 1/2" scored at 4 1/4"
First Layer - So Saffron - 5 1/4" x 4"
Squares x 3 - Old Olive 2" x 2"
Squares - 2 each Share What You Love DSP, 1 each So Saffron - 1 3/4" x 1 3/4"
My July Customer Appreciation is a PDF created by my teammate Holly. 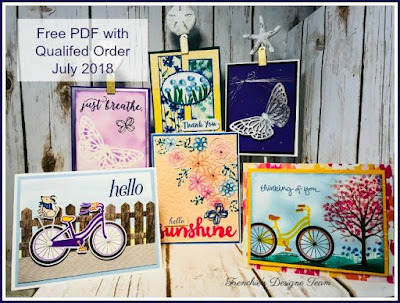 This PDF includes all the instructions to create the 6 beautiful cards pictured above featuring the Bike Ride Stamp Set, the Build a Bike Framelits and the Springtime Impressions Thinlits. All orders of $30.00 or more before tax and shipping placed on my online store with the Hostess Code DCU2ZRCP will be qualified to receive the above PDF. Please remember, you MUST enter the HOSTESS CODE above to receive the PDF :) If your order is over $150 DO NOT enter the hostess code and you will get all the stamping rewards and I will send you the PDF as well.